It has been weeks since my last nail art design and honestly, I haven't been feeling inspired. When I dedicated this online journal as a nail art blog, I told myself that I will try my best to make a mark in the nail art community, to establish a personal style, to help, to inspire, and to gain the respect of fellow nail artists and readers of this site. But like any journey, I have experienced some bumps as I embraced my love for nail designing. A persistent bump that have been the cause of my lowliness is the fact that I have been a prey of copyright infringement many times over. By definition, it is the unauthorized use of one's work. The most common copyright infringement I have experienced as a nail art blogger is having my photos stolen or published elsewhere without my consent. I am quite sure a lot of nail bloggers have experienced the same. In the beginning, I was angry and flattered at the same time. Angry because my nail art pictures were grabbed and published without my permission. Flattered because it made me feel my nail designs were worth stealing. I used to inform the crook via email or I'll simply comment on his/her blog to take down my pictures or at least give proper credits. Eventually, it became tiresome and I learned to ignore it until recently when I found a few local nail salons using my nail designs in their websites or Facebook pages to gain clients. This became the tip of the iceberg. First and foremost, I verified how one becomes a copyright owner. The moment of creating an original artistic work, one is immediately protected by the copyright law. This means that copyright is instantly attached to the nail design the moment I start nail art painting. The same goes for pictures. Copyright immediately attaches to the picture taken the moment the shutter is pressed and copyright ownership belongs to the person that clicked it. I realized that not only do I have rights over the pictures I took of my nail art designs, I also have rights over the designs themselves. I learned that there are several privileges that solely belongs to a copyright owner. When any of these rights is violated, copyright infringement occurs. Further, each of these rights can be sold or assigned separately by the copyright owner. Copying, duplicating, and any form of reproduction can only be done by the copyright owner. This consequently means that no one is allowed to sell, distribute, or commercially exploit the work other than the author, partial or whole. This privilege entails showing the work for public viewing, such as uploading a photo of the work on the internet or hanging it on a wall in a public place. As a nail art blogger, this have been the most common copyright infringement that I keep experiencing. I think it is important for people to understand that posting a photo or any content on the internet does NOT automatically give anybody permission to simply grab the image or work. It does not hurt to practice courtesy and ask the consent of the owner or at least attach proper credits. Placing a watermark on photos is a common practice among artists that uploads or displays an image of their work. It acts as a signature so that people will know the artist behind the work. It also acts as a protection if in case someone uses it without proper authorization from the copyright owner. For most of us (I think), it serves as a precaution that the work is credited if published or reproduced elsewhere without our consent, with the assumption that the watermark was not removed. the nail design should get enough attention. I admit that I used to place a big watermark on my nail art photos. I simply just wanted to sign my nail designs. But I don't want to ruin my pictures by placing a watermark at the middle or anywhere that would touch the nail art itself, so I usually just place it at the corners. This actually makes it easy for thieves to simply crop my nail art photos to eliminate the watermark and still have the design intact. But due to recent copyright infringement discoveries, I was challenged to create a more effective watermark. 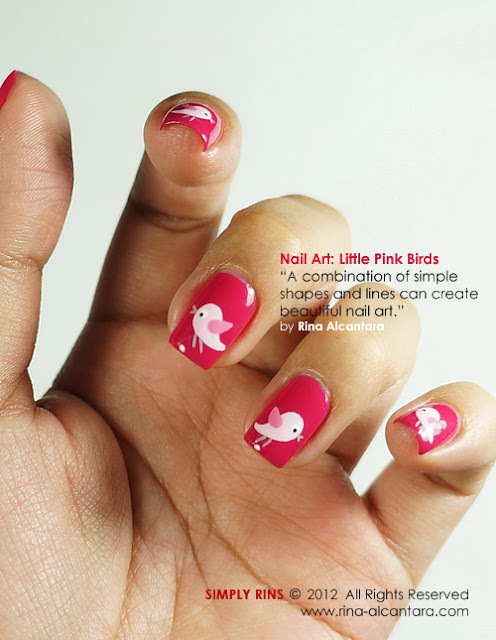 I tried a different watermarking technique on my Little Pink Birds Nail Art. It was suggested by a good friend. An attempt to a have a more effective watermark. One of the first things we learn as a kid is differentiating right from wrong and I am sure that no one will disagree that stealing is wrong. It is bad to take anything that is not yours. When I started blogging, I knew that I'd be risking having my photographs or nail designs stolen or used without my consent. But my goal as a nail art blogger was far more bigger to be let down by that risk so I decided to be more tolerant of thieves until recently when I felt I reached my limitations. Discovering stolen nail art photos that belongs to me became tolerable as this nail art blog grew older. There are times that I inform the owner of a particular site to either take down the photo or give proper credits whenever I chance upon a stolen picture. On Facebook, it was easier to report copyright infringement as long as there is evidence of copyright ownership. Other times, I would ignore the violation as long as my watermark was not removed. However, it became a different story when I found out that there are people and nail salons that use my nail designs for their business without my consent nor did they give me proper mention. I even found a company that offers nail art workshops that uses my designs to gain clients. This is commercial exploitation and it degrades the purpose of this nail art blog and my value as a nail artist. I had hesitations writing this article because I was afraid people would say that I am being too emotional as regards protecting my nail art designs. I never had qualms over personal use of my ideas. But I feel that using my nail designs without my permission for commercial purposes is too much copyright violation. It is not difficult to understand that one needs to ask permission to use something that doesn't belong to them. My frustration led me to seek council to take legal action against those that violated my rights. I want to make a stand and let these people and companies know that they simply can't get away with it. I have worked really hard to establish a good reputation as a nail artist and I can no longer take the backseat and let these people just take my work and ideas for commercial use. I am deeply sorry that I allowed myself to be uninspired because of my recent frustrations. As I was organizing my inbox earlier this evening, I found emails that simply contained messages of appreciation and gratitude towards this blog and my nail designs. I read every single letter all over again and I realized that remembering all of you that took the time to send in those uplifting messages is far greater than feeling down over copyright infringement. Thank you for always reminding me what should matter more. Note: As per research and consultations, there are other rights that envelopes a copyright owner. But I decided to just include in this article those that are applicable to protecting nail art designs and photos thereof. I agree! I do love your blog and you have inspired me to make my own. But your design is yours and don't let anyone take that away. Don't apologize because in the end, expressing yourself is what a blog is all about. It is a cheap shot for the nail salons and nail art school to use your photos. That is just insane that they think they can get away with it. You are wise to look at all your admirers (like me!) for their admiration rather than the thieves who steal. I was wondering what was going on with my(lol) nail art...I mean your nail art of course. I'm sorry that you've had to go through that, and I totally agree with you seeking legal advice, after all; you've had to work hard and long to come up with the designs and to make vids for us and I think everyone who visits your blog on a regular are very appreciative of your effort and hard work! I am disgusted at anyone would go to such lengths without acknowledging your work and seeking permission before doing so. Thanks again for your hard work!!!! Good for you for taking action against the people using your photos for their own profit! hey..I totally understand..and u r right to do what u did!! i don't think you're being emotional at all. in fact, i feel that you've taken very mature, rational and responsible steps towards correcting this problem!! way to go, and i hope that you manage to send a message to all those nail salons and companies out there that STEALING IS WRONG. i'm actually feeling kinda outraged that they're unscrupulously exploiting your creativity and efforts!!! garhhhh. I applaud you for writing this post and sharing your experience and frustrations with us. I fortunately haven't had this happen (who wants my pics when there are pics of your quality out there?!) but I can understand that it is a violation. These are your nails, your pictures, your art - and taking them from you isn't right. I've never heard of business/salons/companies using stolen pictures, but I'm glad you're taking action against it. Good luck to you! And I hope this doesn't keep you from continuing your work. Thanks for doing all that research and sharing it with us! I can imagine how frustrating it must feel to not receive any form of recognition and have your rights exploited by companies. Do keep us updated in the progress of your fighting for your rights. As a beauty blogger, I need to protect my pictures too! I've never commented before, but this post really struck a nerve. I love your nail art! It's always so perfect and drool-worthy :) so I see why people are "borrowing" your designs left and right. But it's still dishonest! And for a business to feel they can just advertise and profit using your stuff without even asking you is disgusting! As far as your watermark ... I see why you don't want to cover up your beautiful manis, but sadly, with the one you used for the little pink birds, these people can still easily place their advertising right on top of your info, as the nails are still fully exposed :( I would go with the swirl watermark. I love your nail art! I am so sorry you were uninspired by the theft. I agree with your opinions completely. I wish there were an easy answer. Please don't give up! I am a new blogger but I have posted for years on a nail board. I haven't been watermarking my pictures, but I'm starting to wonder. I know they get pinned and then repinned at least. Who knows where they end up. I know they do not compare to yours, but wanted you to know I struggle with the issue a tiny bit also. I have learned so much from your blog and your tutorials! When I use one of your designs I always mention you as the original designer :) Fight for what is yours!!! You are a teacher and inspiration for so many of us! this website provides feature based content. Your nails are awesome and so creative. It's sad that no one in this world is free from theft. As much as you try, i'm sure others will still do it because we live in a lying world. From stealing money from bank accounts to the sunday paper. THere is someone somewhere wanting to be dishonest! Please don't let it discourage you. YOu know the truth and can do amazing nails unlike those that steal from you. The Best Five is the no.1 packers and movers in Chandigarh in serving the top quality logistic services including packing, moving, unpacking, relocation, household, offices ,shifting, loading, unloading, transportation etc from the past decade in India. Prestige packers and movers conducts more than 3000 relocations per year. Transferring corporate and government employees households and moving individual customers logistics. Jai Balaji Packers Movers is a Cargo Packers and Movers in Mumbai, providing packers movers services, professional warehousing services, warehousing services, goods moving services, corporate relocation services, loading unloading services and goods insurance services.